LOS ANGELES (AP) -- Ah, chimps. They're so cute and cuddly and furry, so much like us that we want to take them home, assign human characteristics to them and turn them into our hairy babies and pals. Sometimes that relationship can serve as the source of comedy in movies; other times, it can be downright dangerous when we get too arrogant about our place in the animal kingdom. 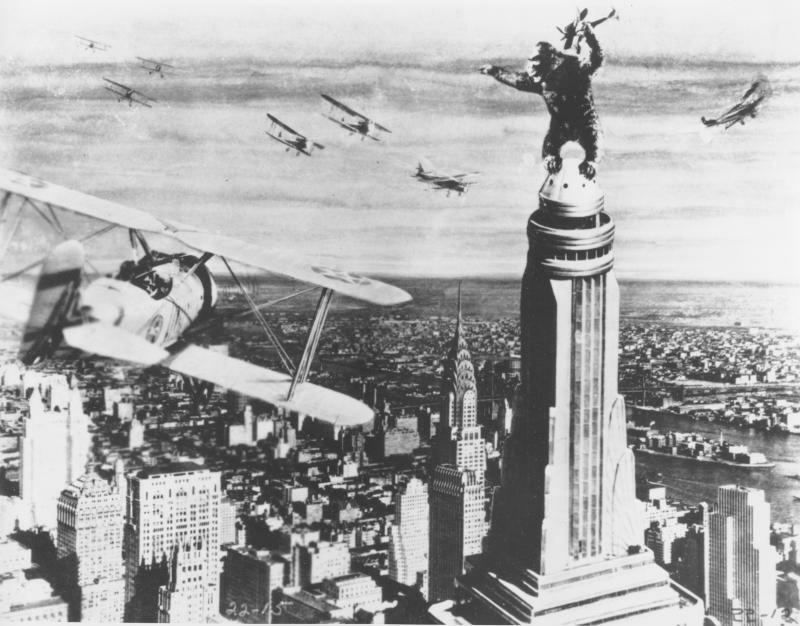 — "King Kong" (1933): The original, of course, although there have been countless remakes and homages, including Peter Jackson's Oscar-winning 2005 version starring Naomi Watts and Adrian Brody. The gorilla is big, scary and misunderstood; the damsel in distress is blonde, beautiful and fascinated. Surely I don't have to explain to you guys why "King Kong" matters, do I? This is an instance in which use of the word "iconic" is not hyperbole. Let's just all acknowledge that and move on. — "Planet of the Apes" (1968): Once again, the original, although the sorta-prequel, sorta-reboot "Rise of the Planet of the Apes" from last year had its thrills and was a huge box office hit, grossing over $300 million worldwide. It's interesting to note that Andy Serkis was responsible for the performance-capture work in both the 2011 "Apes" and the 2005 "Kong" — that it takes high-tech special effects trickery to make us feel the humanity in these tormented creatures. The first "Planet of the Apes" wasn't concerned with convincing visuals; it was an allegory about racism, provided Charlton Heston with one of his most famous roles and served up one of the biggest twists in film history. — "Project Nim" (2011): This documentary from Oscar-winner James Marsh ("Man on Wire") takes a heartbreaking look at a science experiment gone wrong. Columbia University researchers in the 1970s took a baby chimp from his mother when he was just a few days old and whisked him away to a distant place where he knew no one. They raised him among humans, dressed him in kids' clothes, taught him sign language and even smoked pot with him. Their hope was to achieve a breakthrough in the way humans and animals communicate; their reality was far more violent and sobering. — "Every Which Way But Loose" (1978): Clint Eastwood shows his goofy side in one of his earliest comedies, starring as a truck driver and bare-knuckle boxer whose best friend is an orangutan named Clyde. Together the two prowl around drinking beer, bar hopping and getting into brawls. I have fond memories of watching this movie as a kid with its catch phrase, "Right turn, Clyde." It's also notable for the presence of Ruth Gordon as Eastwood's saucy, foul-mouthed mother and an extremely '70s, country-tinged theme song from Eddie Rabbitt. — "The Wizard of Oz" (1939): Granted, it's not really about the monkeys. And granted, I do write about "The Wizard of Oz" a lot. But the flying monkeys are seared into my brain from childhood. They're so scary, they made me cower at my mother's feet behind the coffee table during our annual holiday viewing of the film. In retrospect, no, they don't look terribly convincing. But they're functioning at the behest of the Wicked Witch of the West. And they seem to take such joy in chasing Dorothy and friends through the forest; one of them even looks like he's smiling as he kidnaps Toto. And did we mention that they can fly?